Keeping in touch these days is as easy as the push of a button in most cases but for older family members, keeping up with the latest sharing technology may be a bit more difficult. 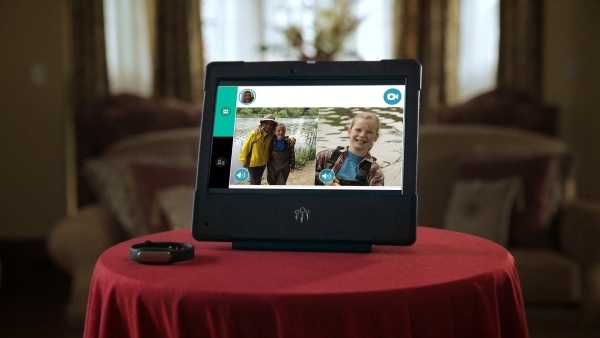 Bloom is an easy to use system to share moments designed with grandparents in mind. Bloom is a system that consists of the Bloomband, Bloomview, and the Bloom app. The band allows you to access the view which is a separate screen where the band wearer can receive photos, video calls and messages. The app allows you to share this media and also view it as well. The Bloomband and view make it simple for elderly people to access media from their family without having to learn a bunch of new technology. It’s all in one place and simplified so that they can keep in touch at the push of a button as well. You don’t need the view to access the media and other family members can use the app as well so thise who are a bit more tech savvy can also reap the benifets. Bloom is shipping in 2016 and will cost $249.